Legal regulations demand that organic impurities in pharmaceuticals must be identified and characterized. The isolation of impurities from a pharmaceutical product can be done by preparative-scale liquid chromatography (LC). 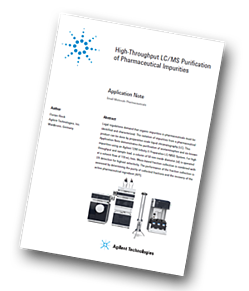 The Agilent 1290 Infinity II Preparative LC/MSD system is used for this application. For high throughput and sample load, a column of 50 mm inside diameter (id) is operated at a solvent flow of 118 mL/min. Mass-based fraction collection is combined with UV detection for highest selectivity. The performance of the fraction collection is assessed by determining the purity of collected fractions and the recovery of the active pharmaceutical ingredient (API). Organic impurities in drug manufacturing can present a major challenge for pharmaceutical companies. By-products and intermediates originating from the chemical synthesis can be present in significant amounts, even in an optimized production process. Regulations such as the ICH Guideline Q3A(R2) demand identification and monitoring of all impurities exceeding a given threshold. The Agilent 1290 Infinity II Preparative LC/MSD system can handle the high flow-rates necessary to operate a column of 50 mm inside diameter (id) and enables fraction collection triggered by UV and MSD signals for high selectivity. It features modules that ensure safe and easy operation while improving the purification outcome. A sample containing 500 mg of acetaminophen and 0.5 mg of each of the six impurities was successfully separated on a 50 mm id column. Each compound was collected in a distinct fraction; the API was split into two fractions because of the large peak width and the resulting high fraction volume. Collection was triggered by a combination of UV and MSD signals at the target masses of the sample components. The purity of all collected fractions was determined by re-analysis on an Agilent 1260 Infinity II LC System. The Agilent 1290 Infinity II Preparative LC/MSD System enabled the separation and purification of a pharmaceutical sample. A 500 mg amount of active pharmaceutical ingredient with impurities at 0.1 % was injected and successfully separated on a 50 mm id Agilent Load & Lock column. Fraction collection was triggered by a combination of UV and MSD signals, which enabled a highly specific collection of all sample components by their respective target mass. The purity of the collected fractions was generally high (99 % or greater), with the exception of one compound. The fraction of the active pharmaceutical ingredient was dried and weighed to determine the recovery, which was found to be 99 % of the injected amount.